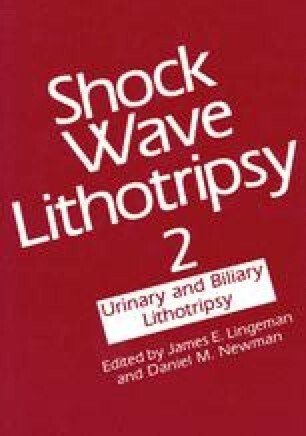 Changes in blood pressure and the incidence of hypertension were studied in 725 patients, 29.1 months after renal extracorporeal shock wave lithotripsy (ESWL*). The pre-ESWL incidence of hypertension was 19.3%, and there was no change after treatment in anti-hypertensive requirements. There was no significant change in systolic, diastolic, or mean blood pressure. Postoperatively, 6% of 585 normotensive patients required treatment for hypertension, and 2.9% have unconfirmed hypertension. The incidence of post-ESWL hypertension in patients with pre-ESWL diastolic pressures less than 90 mmHg is greater than that predicted by data from a population not exposed to ESWL.